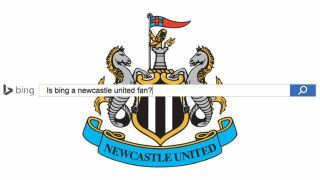 Toon army, Bing! Toon army, Bing! Bing Predicts reckons it can call who is going to finish where in the English Premier League table, and according to Microsoft's search it's bad news for Leicester, Burnley and QPR, but really, really, really astounding news for Newcastle United. Bing reckons that Newcastle will pick up every single remaining point from the remaining four fixtures, turning round a tough season at the death. We always knew Bing was secretly a Geordie, and not just an algorithm that allegedly uses search, social, and other relevant data to make intelligent predictions. At the other end of the table, Manchester United will apparently be usurped by their neighbours Manchester City in the race for third , with Arsenal solidifying second spot. And Spurs fans look away, it's going to to be your manager's former club Southampton that picks up the sixth spot.